What a Basic Commercial Use of Fonts Licence allows for. Use of JulesLove in Creme magazine and julesgirltalk on a Pumpkin Patch brochure. To make sure both of these are acceptable uses of JulesLove fonts, despite multiple copies being made, we should be notified of its use and the official distribution point of the fonts cited, the useage has to be registered with us on the licence form and a copy or image of the item sent to us for our records. It does not necessarily mean that the mentioning of this website as the distribution point would happen on the item itself, it could happen on a pinterest pin or elsewhere. You can read the actual licence here. A few people of asked, as the above items are distributed to a wide audience and the magazine is for sale, why does this not qualify as needing an Extra Commercial Use licence? In the case of the magazine header, it is because the font itself is not part of the overall sale. It is merely used in a header in a single article. As for the Pumpkin Patch brochure, this was not an item for sale but as a give away, so is acceptable for mass-production. 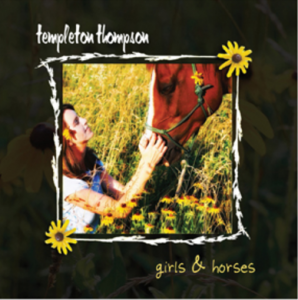 Another user who did everything perfectly was Templeton Thompson, who used julesgirltalk on the cover of her CD “Girls & Horses“, contacted me to register its use and mentioned on the back of the CD cover that julesgirltalk was the font used for the title. She also mailed me a copy of the CD. For this reason, I am happy to promote her here, and if you click on the image above, you can find a link to her fantastic album. I am happy to create exempions for some of these terms if it is not practical, or we can brainstorm alternatives. Please use the licences form to let me know why you require this.